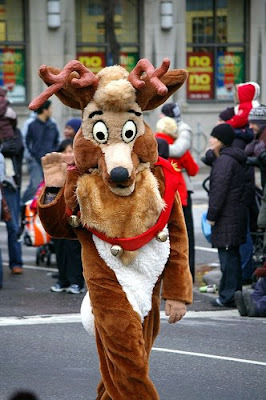 Sunday was the Toronto Santa Claus Parade. I have been marching in it for the past 14 years. This year, I was set to be a Santa Guard. Unfortunately, when I showed up and tried the costume, I discovered that they had given me size 29 waist pants that I could definitely not fit into. They take your measurements in the spring and select a costume for you. This was the first year I ever had a size screw up, so they're pretty good considering the number of marchers. So, what to do? I found the costume room manager and she told me they keep spare Greeter Clown costumes for those who can't fit their costumes. I picked one out, but after 11am when they start calling on backup people to fill costumes for no-shows, I saw that none of the 3 Reindeer costumes had been filled. So, I asked if I could be one of them. Sweet! It was actually my second time in one of the reindeer costumes. Kids love them. Also, it was a really cold day, and being upgraded to a furrier, warmer costume was a plus. Here, through the wonders of flickr, is a picture of me from someone I don't know. Thanks. I can tell it was me by the gloves and sleeve poking out near my wrist. Posted by Andrew at 11:49 p.m.